would want to make it. 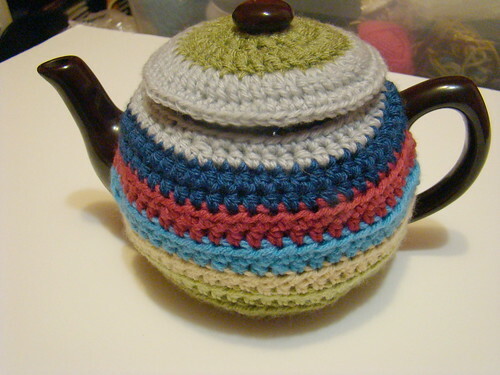 So I made a second cosy and wrote up general instructions. to give line by line detailed instructions. wait for the newer version. and eventually close this post down. if I could post the pattern (my apologizes for taking so long). and diligently wrote down each row and each stitch count. instead of giving you a list of numbers. your pot instead of mine. This cosy is made, starting at the bottom. so that you can make the necessary increases/decreases. while I worked to make things easier for me. the cosy will not want to stay on the pot. (under the handle) closed with some yarn. it will stay on easier. be easily slipped on and off the pot. 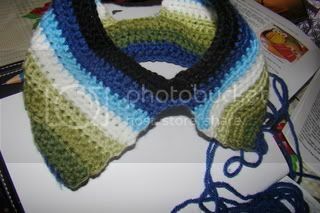 and I ended rows with 2 chains for turning. trust me.... your pot will let you know. There are 4 sections to the body. The size of each section will vary with different pots. And here is a shot showing the opening for the spout. The cosy is shown right side up. 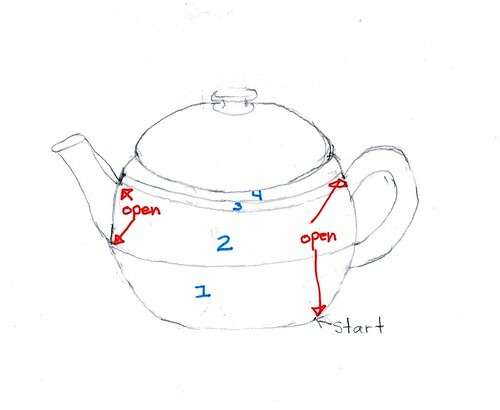 Notice for this teapot that the opening for the spout starts really low. 1. Bottom section: This is worked in rows leaving an opening only for the handle. is finished. (Or you can add more chains and work the tab). Make as many loose chains necessary to go from the the edge of the handle around the pot to the other edge of the handle. I found that my yarn stretched so I took that into consideration. Add 2 more chains for turning. Work rows of hdc turning at handle. Your last row should just touch the bottom of the spout. 2. This section is worked leaving both the handle and the spout open. You will now work 2 sides separately. Each side will be worked in rows between the handle and the spout. When you are finished side one break yarn. (If you finish on your first row of a colour then leave a longer tail (long enough to make a full row of hdc around the pot. If you finished on your second of a colour then just leave the usual tail length. You'll see why in section 3). Join new yarn to second side and finish that side to same height as first. Break off yarn as usual. 3. This section is worked with an opening only for the handle. You probably only have to work a couple of rows for this section. Join new yarn to the first stitch on side one (handle side)...or use dropped yarn. Continue crocheting across second side turning at handle. Continue working rows back and forth until you reach the height of the top of the handle. 4.This section is worked in rounds not rows. to give you an idea; I went from 68 st to 55 st over 5 rows. I worked the entire lid in dc. I chained 16 joining with sl st.
to the normal pattern of a flat circle. If you haven't added a tab for under the handle you should add it now. so that I could form a small tab below the handle. I made a space for the button by making a few slip stitches. just to clean up the edges. edged in a single colour. and I'll try to clarify it. or claim it as your own. super cute! hopefully soon i can make one! What a lovely look through your gorgeous blog I've just had! 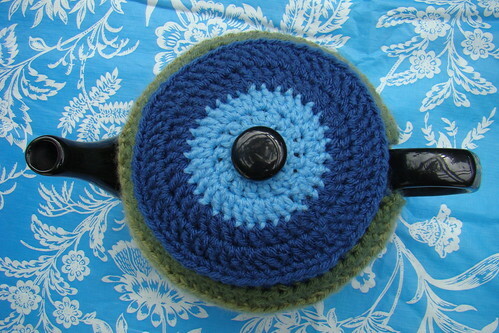 Love your tea cozy too!!! ..as you can see I really have a thing for teacosies. Hi, I was just wondering which of your photo's showing the neck of the pot and the whole where the handle goes, is shown the right way up? as the colour patterns are different in each picture. 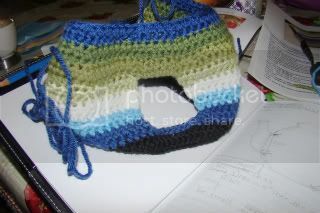 I have just started this tea cosy (using rainbow wool) and cannot quite work it out, probably cause I cannot read/understand a pattern so your instructions being just that instructions are making it easy for me. I emailed you a more detailed response but thought I`d also answer here for others to see. In the first picture the cosy is upside down and in the second it is right side up. I added these details to the caption. Thanks for bringing it to my attention and also sorry for any confusion. I basically like to get lost. Lost when I travel, lost in whatever craft I'm involved in, lost in the joys of life! Please note that my patterns, projects and text are copyrighted and may not be used in part or whole by anyone without my written permission. Also, anything made from my patterns are for personal use only. I have no problem with anyone linking to my work as long as I am also credited as creator of said work.